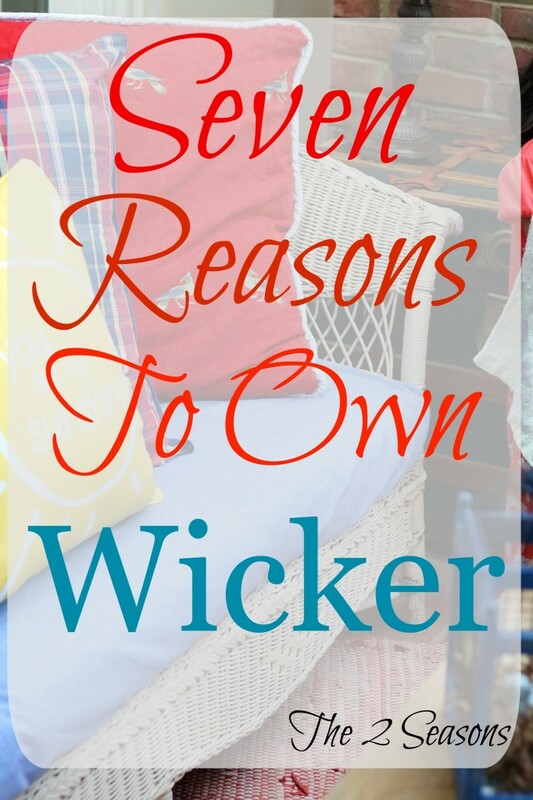 Here are seven reasons to own wicker. 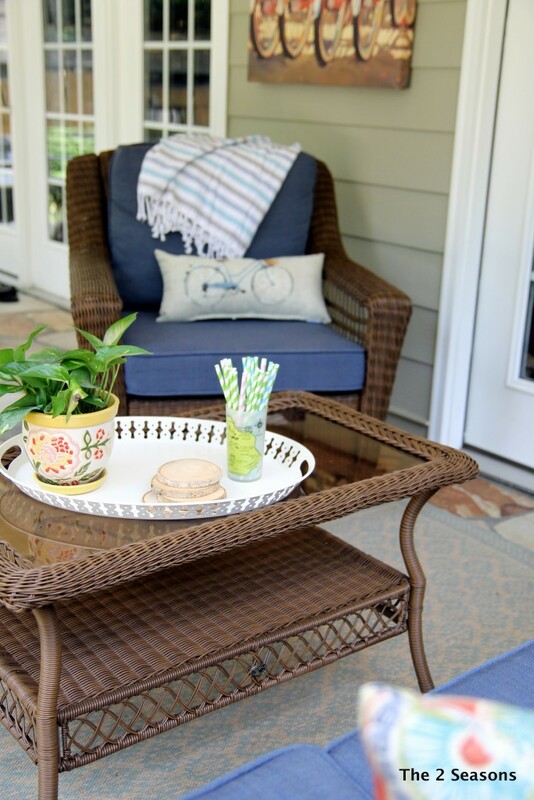 We both love wicker porch furniture, and since it is porch sitting weather, we thought it was only fitting to revisit this post from last July. It has seven great reasons to have some wicker in your home. Sadly, Mom no longer has her sunroom and old wicker sofa, but don’t fear. She has purchased a new wicker set for her new porch/sunroom in their new house. 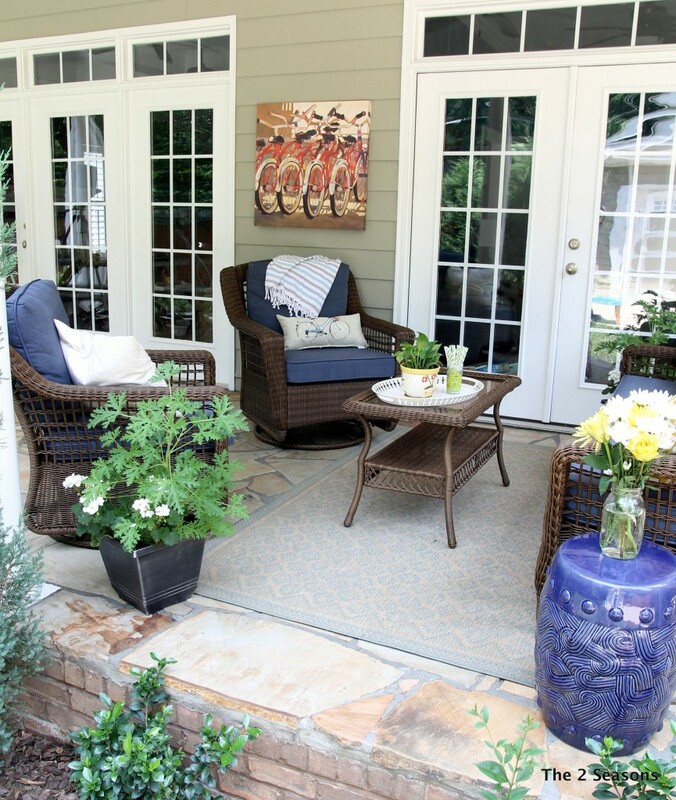 To see the updated version of our porch, you can read that post here. Enjoy the revisit. Over the years I have owned and loved some favorite pieces of wicker. Most of the wicker that I have owned have been vintage pieces purchased at estate sales and auctions, but I have also bought some new pieces. Wicker probably doesn’t get the love and respect it deserves. 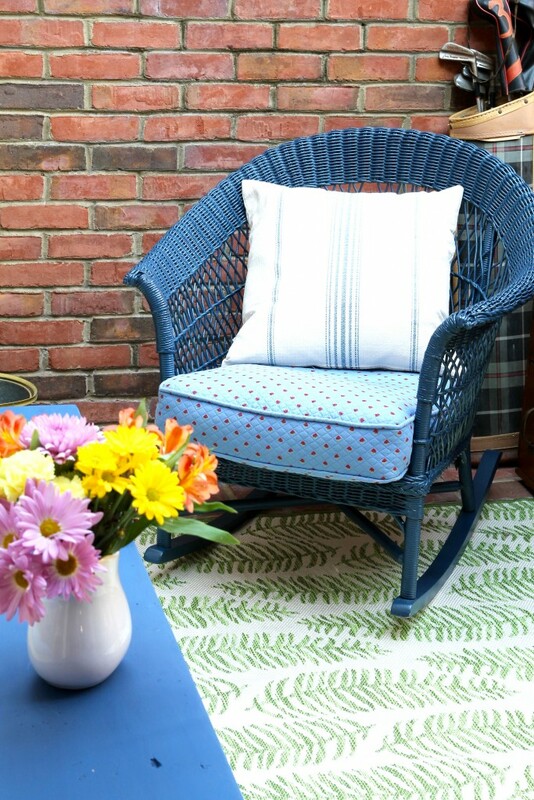 We came up with seven really good reasons to own some wicker. If you haven’t thought much about it, maybe one of these tips will give you a reason to love it, too. Wicker is so versatile. It is as much at home in formal living room as it is in a beach side cottage. It can be used on a front or back porch, in a garden, in a sun room, in a bedroom, beside a fireplace, or in a green house. One of the things I love about wicker is that it is so light weight. It you want to move it from one room to another, it doesn’t require a moving crew. You can just lift it up and carry it where you want it to go. I have moved my wicker chairs all over the house, and even up and down the stairs without any help. That’s always a plus in my book. Wicker is so easy to clean. Once or twice a year I take our wicker furniture to the courtyard and spray it down with a water hose. Then I leave it outside to dry thoroughly. The rest of the time I just use the vacuum and the soft brush attachment to remove any dust that has collected on it. 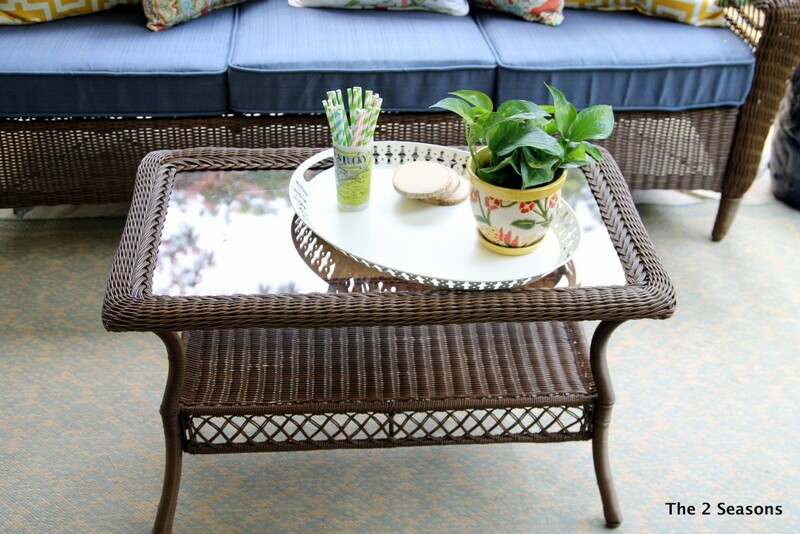 The look of a piece of wicker can easily be changed with a can of spray paint. Using spray paint is so much faster than using a brush and a can of paint. 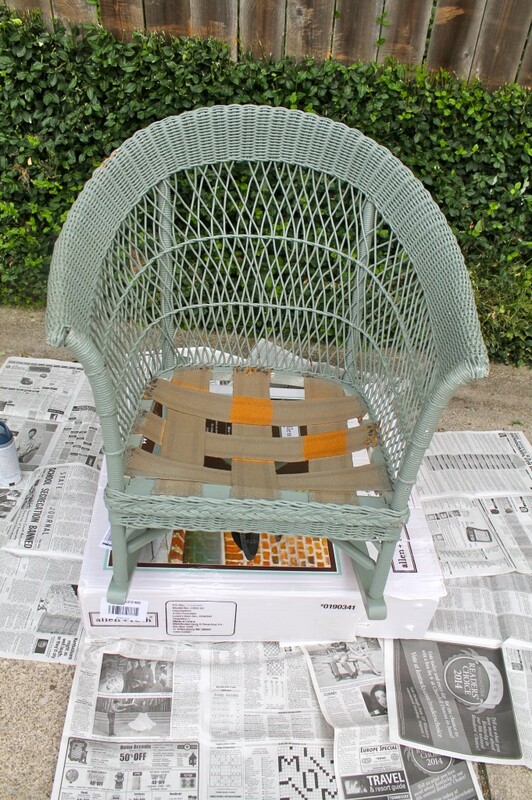 My wicker furniture has been several colors, but right now most of it is neutral other than the blue wicker rocker. 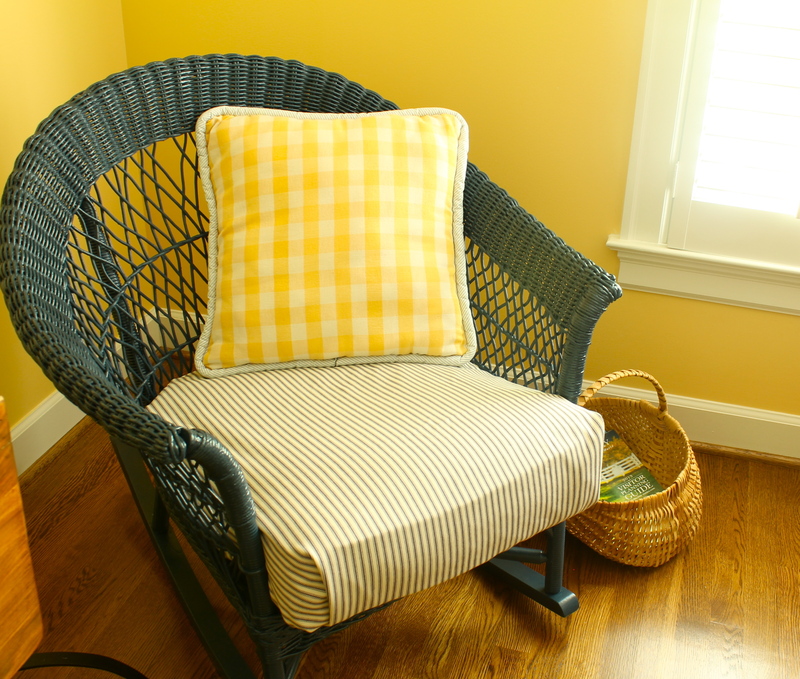 With just two cans of navy blue spray paint and less than 30 minutes of time, the above wicker rocker went from green….. 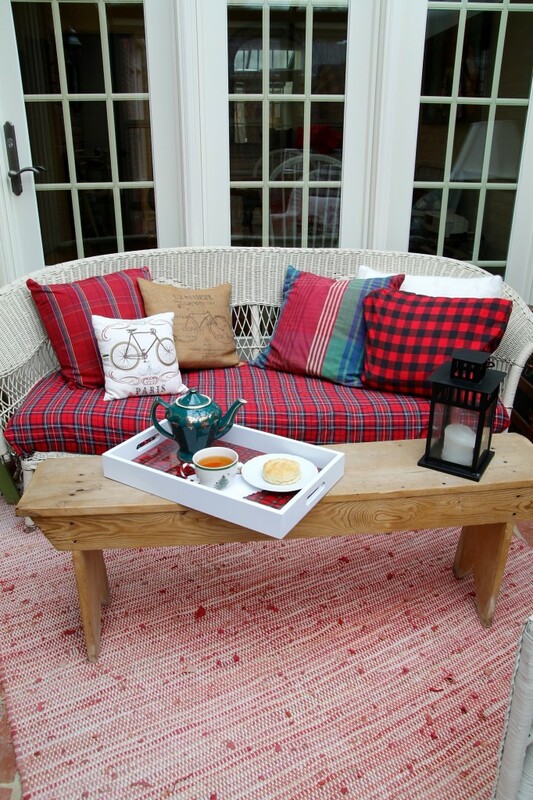 The look of wicker can easily be changed with cushions or fabric. 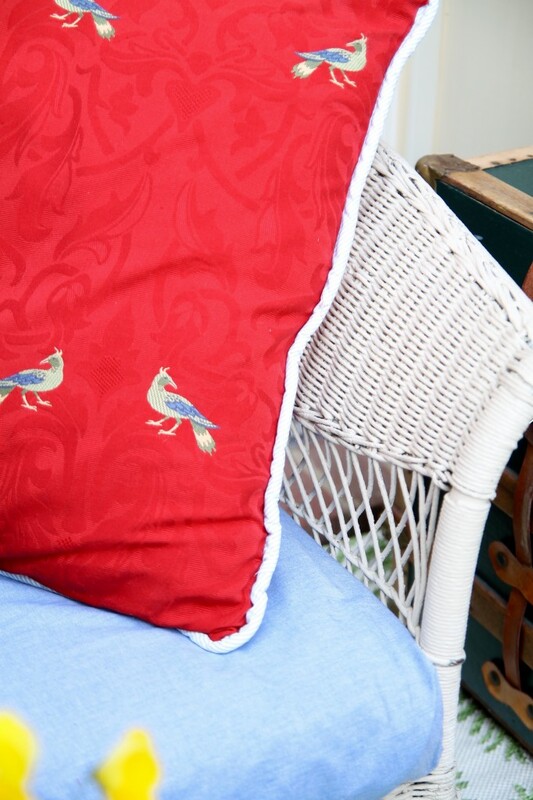 For instance, the cushions on the wicker sofa in our sun room are upholstered in red and white ticking. 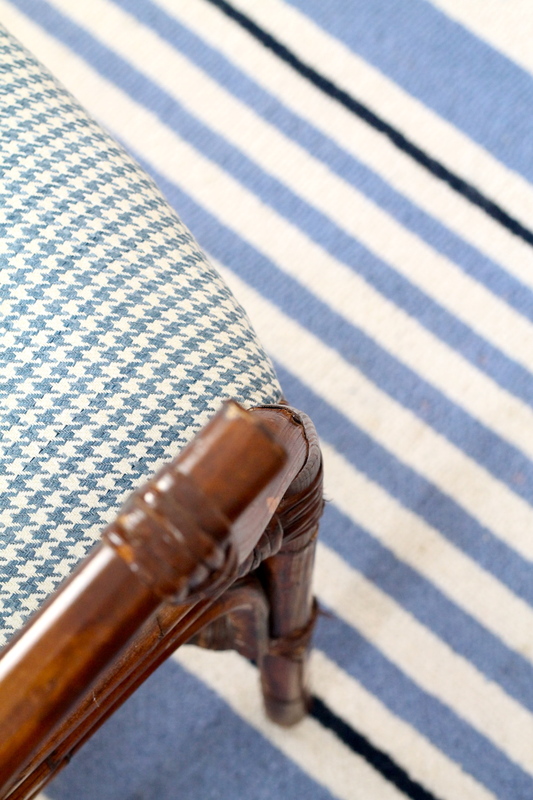 At Christmas time I cover it with a piece of plaid flannel fabric to give it a winter vibe. 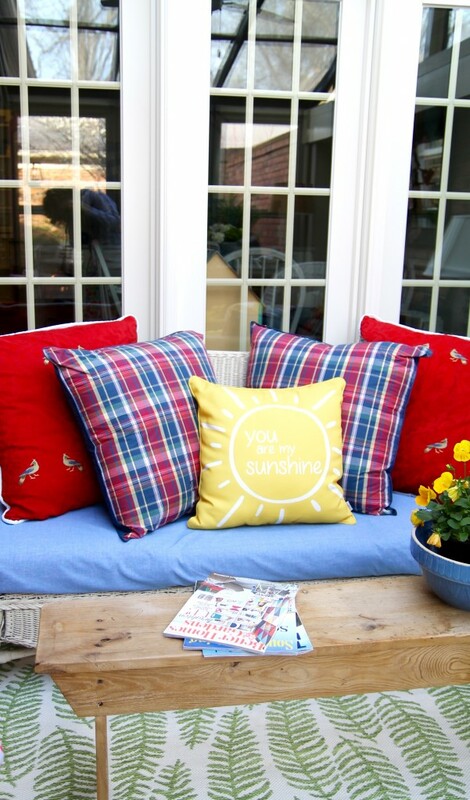 This past spring I decided to change the look by covering the cushions with chambray fabric. Individual cushions that are available at big box stores would work perfectly on any of the wicker chairs that I own, but I usually just switch up the look by using different throw pillows. Wicker adds warmth, texture, and character to a room. Maybe that’s why we all love baskets so much. You don’t have to stop there, though. There are wicker trays, wicker bed trays, wicker lamps, wicker dressers, wicker beds, trunks, and more. This small wicker dresser in Little Miss’s room fits nicely in a corner and provides a place for her lamp and extra storage. Wicker will last for years and years. The wicker sofa in our sun room is over 100 years old. The dresser in Little Miss’s room (above) was in Jordan’s room when she was a little girl. Wicker steamer trunks are still being used in home decor today. That’s one of the reasons Jordan bought wicker for their back porch. She knew it will last many, many years. Do you own any wicker in your homes, and do you love it as much as I do? 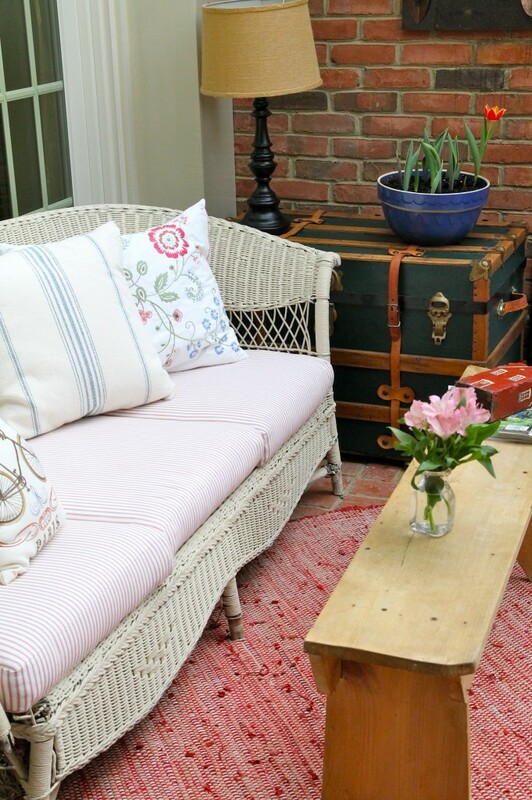 I love my beautiful white wicker, it is such easy care and so versatile. I have a new piece I am on the lookout for. Beth, we love your porch.